“Mommy,” says five-year-old Z, “Can I play cuh-pew-tah?” hoping that by using a fake baby lisp it will increase my chances of answering in the affirmative. It usually doesn’t work. I don’t know why he keeps trying. Z is a boy that has never been good at occupying himself, which, in my opinion, is a bad trait for a child to have. The only way he ever thinks to entertain himself is screen time in one form or another—computer, television, Wii, Nintendo DS. We’re not a family that likes kids to overly rely on screen time. We definitely do in the winter more but I’ve come to accept that. But Z, and to a lesser extent his seven-year-old brother E, want to have screen time constantly. Last weekend was particularly bad--it was too cold outside for much outside play and Mom and Dad were both sick. Days like that certainly call for more screen time but they wanted to go from one screen to another with no break. And these are little boys that really need physical activity. “I think we’re actually going to start having a lot LESS screen time,” I answered him. As I said it, I wondered what my approach would be. Minutes played happily without fighting to add up to screen time credits? Quitting cold turkey? Maybe I’d look online and get some good ideas . . ..
“I think EVERYONE in this family should try that,” piped in Daddy O. Still I know there is truth in his words. I can use the computer a lot but I really don’t need to have the laptop open 24-7. It’s not a good example and it’s keeping me from engaging fully with my family. I’m a grown-up, I can make that happen. 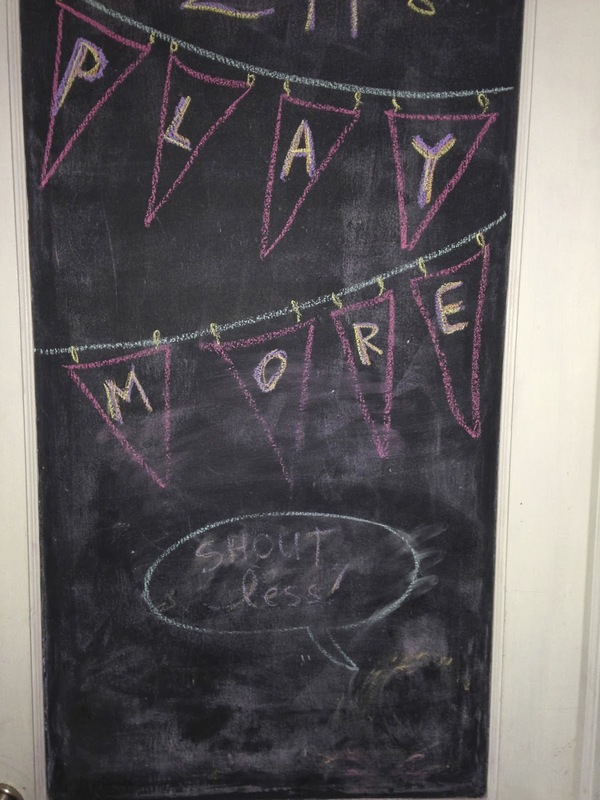 Play more. Shout less. It’s starting to fade away but my resolve should not. Maybe if I just remember to play more, the draw of the screen will be less for both them and me. The next morning I had my coffee and email/Internet check before the kids woke up, like usual. Then, not like usual, I completely closed the laptop and moved it off the counter. At lunchtime, while the other kids were in school, I actually sat down at the kitchen table next to my preschooler. While we ate, we looked at some project ideas in a family magazine together and decided to try the “Snow Dough” together. (http://theimaginationtree.com/2012/11/snow-dough-recipe-for-winter-sensory.html) After eating, she helped me measure and mix and I played with her. When the others got home from school, we all snacked and most of them played with the snow dough a little bit. I told G that I didn’t want him sitting around reading comics on his iPhone, but told him he could read real comic books. “What difference does it make?” “You know how you get headaches sometimes? Sitting around staring at a small illuminated screen doesn’t help that. And you’re going to wear your battery out.” He stuck to the real books. When the snow dough novelty wore off and before they could start asking to play “cuh-pew-tah” I said, “Who wants to play a board game?” The bigs both opted out but later G was roped in as Z needed some reading and writing help for the game they chose. We played and nobody noticed the lack of screen time. Then it was time for me to make dinner and little boys to get homework done. I told Z he could go play on the computer for 20 minutes and while he did, E sat at the island in the kitchen so I could work with his homework one-on-one with him while I also prepped dinner. Then we switched and E got his turn while Z sat at the counter and did his reading for me. The boys each got a bit of screen time without bothering me or having to resort to baby talk. They each got time with Mom alone while doing their homework. I decreased my own screen time and increased my quality time with my younger kids. Riding on that high, I played with my older kids when the younger ones were tucked in and had some honest belly laughs while we were at it. The next day I wondered what I’d do with the kids that day to keep us all engaged with each other instead of our screens. 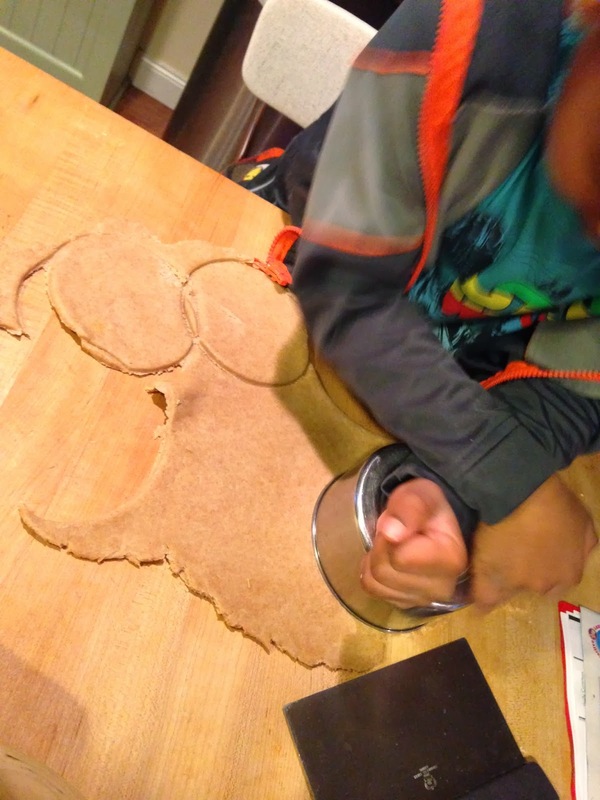 This time I thought of two of my kids’ resolutions: to start to learn to cook more. Before the bus came, A and I made empanada dough and filling as well as pie crust and pot pie filling. When the kids got home, G started to go for his iPhone again and I reminded him we’re not doing that after school anymore. I told him to help me make the mini pot pies. He’s not one of the kids that wanted to learn to cook but he still needs to (please note reference to trying to make boxed macaroni and cheese with him here: http://www.sisterserendip.com/2013/12/the-great-laundry-experiment.html) learn his way around a kitchen. He really loves pot pie so it wasn’t hard to convince him to help. He made one tray of miniature pot pies to freeze for school lunches and B made another tray. I was surprised at how little Z was asking me for screen time while this was going on. He asked once, I said no and then I praised him on how nicely he was playing with his little sister. He kept playing. Later he and E took turns helping with the empanadas and then, like the night before, took turns on the computer while the other got to work on homework with Mommy. Is this Parenting 101 stuff? Definitely. It’s basic stuff that I should have been doing all along and it somehow got away from me. It's the stuff I used to do back when I was the world's greatest babysitter and not the getting burned out I can't believe I still have a preschooler Mom of five kids. Little bad habits added up and left me at the end of the day feeling like I wasn't the kind of parent I knew I could be. But one of my favorite things about parenting is that each day’s a new chance to do better. I can recognize the habits I don’t like and can figure out ways to change them. Good days like these past two make me feel like I might actually know what I'm doing. It's not a bad way to feel. I think I'll keep at it. Funny, this is our family topic of the day! We had a new baby last week who is in NICU. Mom and dad have been tired from caring for kids in shifts and screens have taken over! Tonight, I called time out on screens and we played freeze tag, hide and seek, a board game and cooked dinner together. Sometimes we just need a nudge.